This is the true story of how one woman turned a commitment-phobic man into a loving husband (with a little help from friends and family). This is the story of Hilary and Marc. 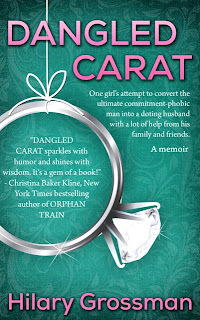 I have to commend fellow blogger, Hilary Grossman, for her courageousness in writing this book. She opened her heart and let it flow into the pages of her story. Not many people would leave their emotions open to the world, but she did and she did it beautifully. You can feel the pain, joy, happiness, love and fear all rolled up in one relationship. Readers can’t help but feel the emotional rollercoaster ride she took on her journey to marriage. She doesn't only talk about her relationship with Marc, but she also writes about losing her father at an early age and her relationship with her mother. She shares her life with the readers. 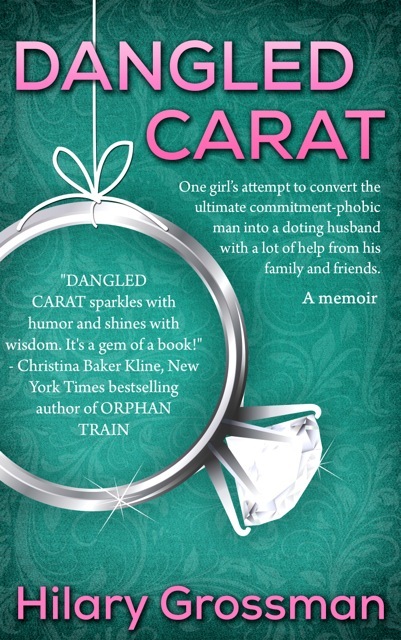 Dangled Carat is fast-paced. Once I started, I couldn’t stop. Hilary puts into words the fears and emotions many women go through. It’s easy to identify with her and feel everything she is going through as you flip through each page. It’s believable, realistic and well written. What an amazing job she did! It would take courage to write a book such as this one. It sounds like the honesty of this book draws you in.